Alright we’re kicking these projects in the rear this year! I think I’ve determined we’re seasonal bloggers. During the winter months… I’m awful. I mean, really awful at keeping up. Ah well, today is a new day and I have a project to share. 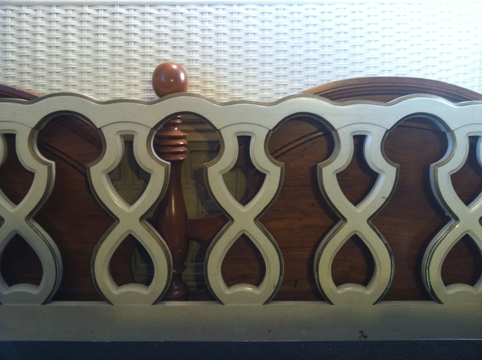 This 60’s French-styled gem is our new headboard, found at Whitly’s “seeing is believing” for $90. “Seeing is believing” is Whitly’s tag line, and trust me, it’s spot on. 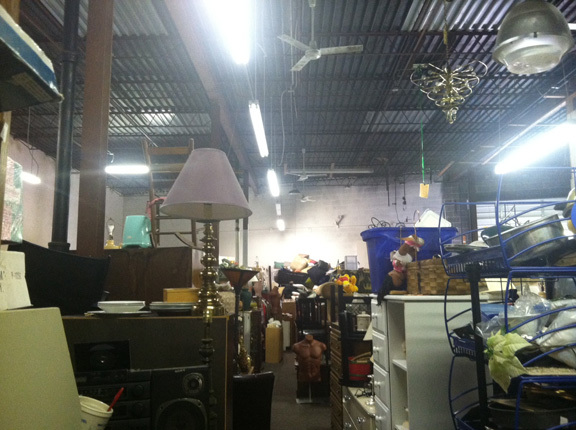 If you are from Indy or anywhere near Indy and you happen to love digging through stuff all for the potential of maybe finding something half way decent for an okay price, well, Whitly’s is for you. Though I love the grandure of a gigantic four poster bed… it just isn’t reasonable for our room. It dwarfs our elongated space. We’ll be storing it for a future time of who-knows, maybe-we’ll-own-this place-one-day-and-need-it. 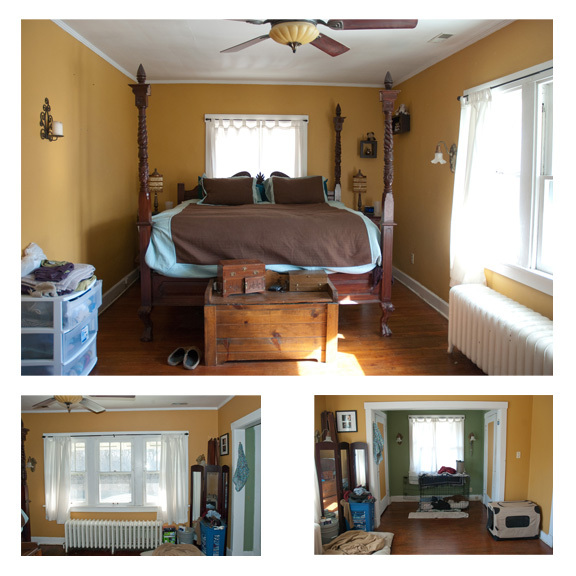 So my vision for our room has developed into a simple, breathable space that would comfortably house the three pups and ourselves all in a beautiful way. Here’s a rough concept of what’s in my head. 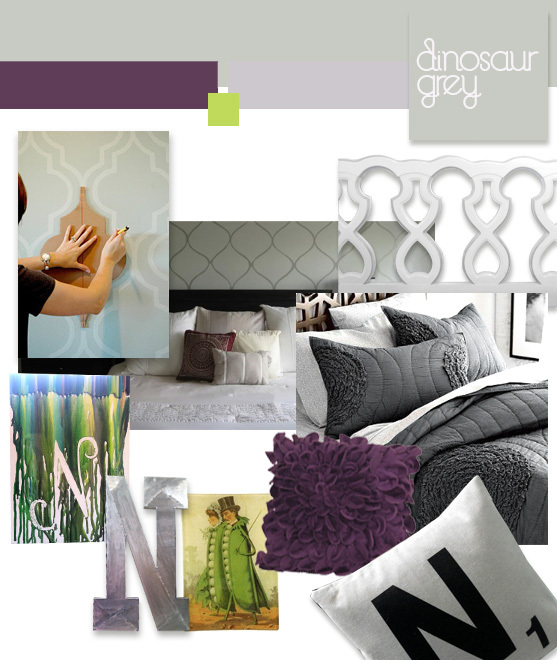 I’m loving the glossy design on a matte wall and have loved this Dinosaur Gray color and various shades of light, faded green with a splash of plum. So some sort of design will some how come about on the wall with the bed itself. 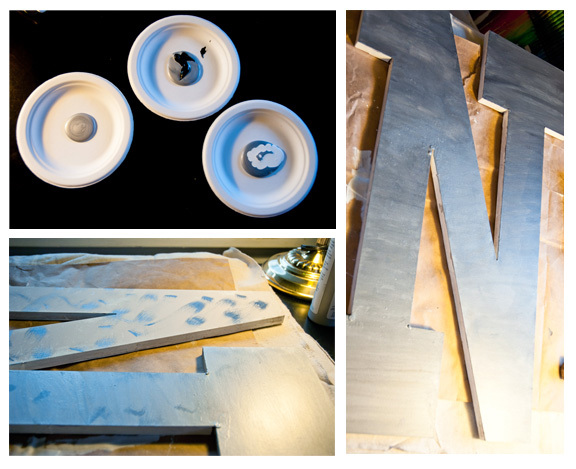 I’ve also been making various “N”s for our last name. I think that may wind up as a collaged design above the now-much-shorter bed. Some of the challenges in this design are 1. The husband doesn’t want it too girly 2. We have 3 dogs that refuse to stay off the bed. 3. I love plush beds. That said, I ran across this tutorial for creating a zinc look to a peice of furniture. I really liked elements of it, but wanted to see if I could push it just a touch further. I like the concept of mixing a semi industrial (masculine touch) look with a breathable feminine touch (French eclectic/country). So, I’d like to do this faux zinc painting style on the headboard and incorporate it in a little. Perhaps to the boy dog beds too. One of the very valuable lessons I’ve learned in the multitude of projects – both artistic and not so artistic – is that you should have a “tester” piece before ultimately diving in. This prevents great amounts of disappointment and or finances when the project just refuses to work out. 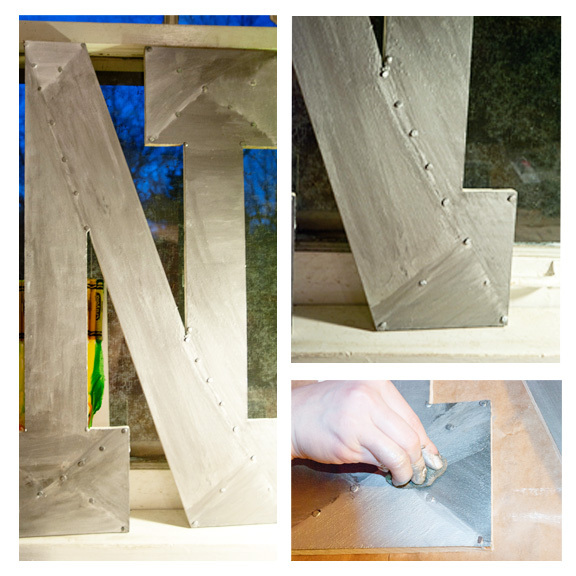 So, I decided to zinc-ify a wooden “N” the husband found. 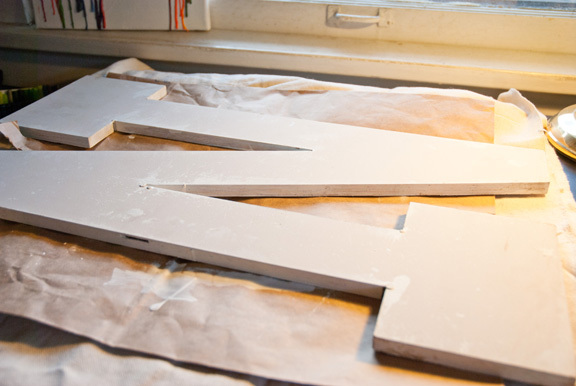 First I followed the original faux zinc painting tutorial. Up until the glazing. I used a light, dark and medium version of the metalic silver and wiped it on in various strengths to assist in getting a more multi-dimension look to the wood. I did hammer in a few carpet-tack nails to help the look of metal be more convincing. Next I broke out the tube of silver. It’s not quite leafing and not quite paint. This stuff has some serious fumes so if you find yourself getting light-headed over a sharpie, you should probably open some windows or turn on a fan. I used a brush to move the silver over areas that just needed a little extra and really made it strong in some of the smaller triangles – again, keeping the look of metal in mind and trying to show strong areas of reflection vs shadow. All in all, I don’t think it looks half bad. I may tone down the brightness for the headboard, and I think I’ll go a different route with the nails so it’s not too masculine looking, but I do think I’ll give it a go. Hopefully this weekend I’ll be able to show off a headboard. I know, just a complete shock…break the news gently to you know who, please.